Valentines day will be coming up soon, and instead of handing out the same old conversation hearts with quotes we've all heard 100 times, we had the opportunity to make our own, completely personalized candy messages! Brach's Create Your Own Conversation Hearts were a cute and easy way to allow the kids in our homeschool group the chance to say what they want to say this holiday. Creating their own heart was as simple as taking the red food coloring pen and writing on a blank Brach's conversation candy heart. 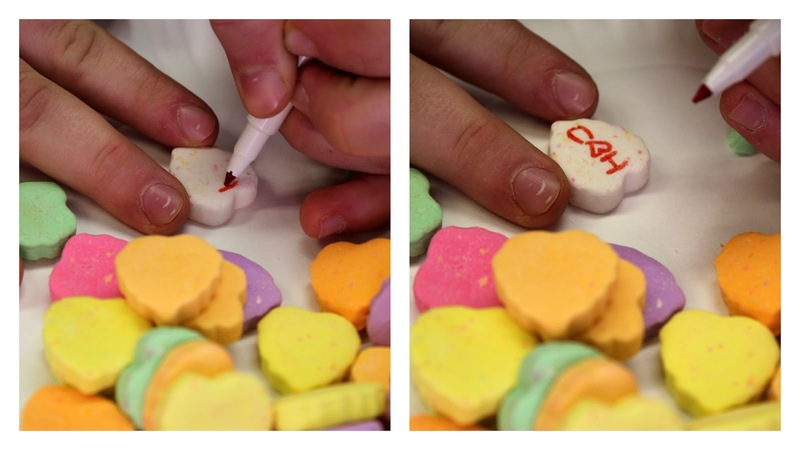 Even though the larger candy hearts were included in the kit, it can be a little challenging for kids to write their message. With a bit of practice, however, they had decorated all the hearts with cute phrases such as "I Love Mom" and "Love you, Dad" and also fun smiley faces! They taste just like the hearts we grew up with (my favorite is the yellow "banana" flavor), and they make great additions to the classroom Valentine's cards! The hearts, which are brand new and exclusive to Walmart, are available in store with the Valentine's items!